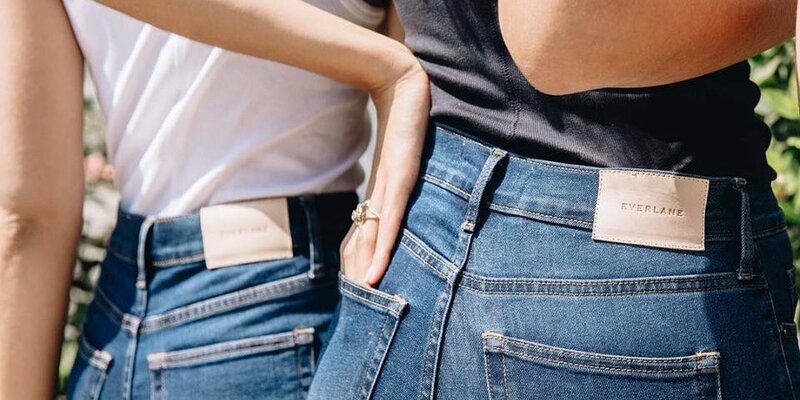 Everything you need to know about Everlane denim. Everlane is as essential as they come. The direct-to-consumer brand first launched in 2011 with a commitment to “radical transparency”, and we’ve been blessed with season after season of classic, high-quality basics ever since. And even better? The label values and recognizes diverse body types thanks to their inclusive sizing across all categories. From their perfect white t-shirts to waffle-cut cashmere sweaters, they’ve proven over and over again that they can be counted on for thoughtful, modern designs. Last year, with the launch of their denim collection, bottom halves everywhere were thrilled at the addition to the brand. And this year they did it again when they launched their Authentic Stretch Denim collection. Stretch denim is one of those things that usually sounds better than it actually is. What starts out comfortable, forgiving and flattering ends up baggy and stretched out after you really wear them in. Everlane’s stretch denim banishes all thought of diaper butts. How did they do it? By making sure to use high-quality denim with a unique yarn that makes your jeans snap back every time. If stretch isn’t your thing, fear not. They also have a full collection of regular ol’ denim in all your favorite silhouettes. There’s a relaxed boyfriend jean for those of you who are anti-skinny jean (#notightpants). There are super-high waist, mid-rise, and even a crop. Basically they have everything you’d want from a pair of jeans. Plus, they have options for ankle length or tall. As a fellow tall person, I feel seen. With prices starting at $68 a pair, there’s no reason not to try at least one pair. Shop our edit below. Your booties will thank us.